Was about to post this when Cynthia died. So I held off. Still, it's a bit of Beatles history anyway, isn't it. A never-before-seen dossier detailing the bitter breakdown of John Lennon's marriage to his first wife Cynthia has been uncovered after nearly 50 years. The five-page document, drafted by the solicitors dealing with the Beatle's divorce in 1968, reveals details of his increasing drug use and his affair with Yoko Ono. It centres on claims made by Dorothy Jarlett, Lennon's housekeeper of four years, on what she saw while working at the Lennon family home Kenwood in Weybridge, Surrey. The papers, which will go up for auction next month, also details his mood swings, aggressive behaviour towards his young son Julian and heated arguments between him and Cynthia. Mrs Jarlett describes how Yoko Ono would visit the country pile while Cynthia was out of the country, and how she once found the pair in bed together. She reveals how Lennon became nonchalant towards his wife around 1967 - five years after they tied the knot - when the Beatles were at the height of their fame. She said Lennon was uninterested in playing the father figure role and that he would smack Julian if he misbehaved. The statement was made to Herbert Oppenheimer, Nathan and Vandyk - a firm of solicitors in London employed by Cynthia following the breakdown of the marriage. They then sent a draft version back to Mrs Jarlett, who made amendments and crossed some sections out - marking the retracted statements with a blue pen. The document has never been seen before because Lennon and Cynthia settled out of court, with Lennon agreeing to pay her £100,000 and give her custody of Julian. It was found among Mrs Jarlett's possessions following her death last year. The documents are set to fetch £5,000 when they go under the hammer at Omega Auctions in Warrington, Cheshire on March 24. It has been suggested the Lennon family may buy the document to stop it being widely published. Mrs Jarlett, who worked for the Lennons for four years, wrote: 'I was first employed by Mr and Mrs Lennon in August 1964 as nanny/housekeeper. 'My duties were generally looking after the house and taking care of Julian when Mr and Mrs Lennon were away. 'My work did not involve sleeping in the house except for periods of time when Mr Lennon and Mrs Lennon were away and then only to look after Julian and the house. 'Until about the summer 1967 I thought the house was reasonably happy. I do remember some differences of opinion between Mr and Mrs Lennon but nothing out of the ordinary. 'Mr Lennon was frequently away on tour, filming and recording and I did not see very much of him. 'I do not think that Mr Lennon showed the usual interest the father showed in the household. He was certainly not bad with Julian, but he appeared to be preoccupied with other matters. 'From about a year ago Mr Lennon did not seem as keen as before to take Mrs Lennon out with him to various functions, studio recordings etc., to which he had previously taken Mrs Lennon. 'I quite often heard Mrs Lennon ask whether she could accompany him, but he had refused, making excuses for not taking her. He would only take her, if they had been invited out together. 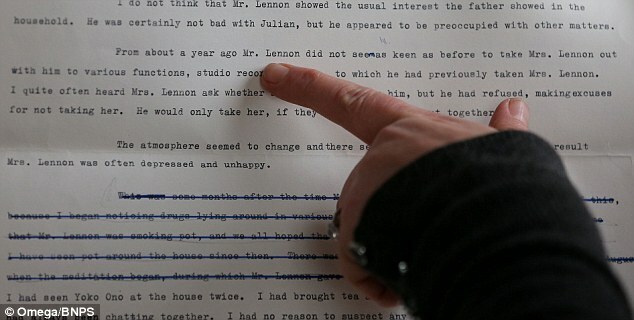 In a section of text she later crossed out in blue pen, Mrs Jarlett recalls how she discovered Lennon's drug taking habit after he left packets of cannabis lying round the house. She wrote: 'This was some months after the time Mr Lennon started taking drugs, I knew of this, because I began noticing drugs lying around in various parts of the house. 'It was quite clear to me that Mr Lennon was smoking pot, and we all hoped that it was a phase and that he would get over it. Describing what she had seen of Yoko Ono, Mrs Jarlett wrote: 'Before Mrs Lennon went to Greece, I had seen Yoko Ono at the house twice. 'I had brought tea and coffee into the room and John and Yoko had always been chatting together. 'I had no reason to suspect any illicit associations. It appeared to me that she was rather more a friend of John; she always spoke to John and I never saw her talking to Mrs Lennon. On a later page she told of how she found Lennon and Yoko in bed together. Mrs Jarlett also described Lennon's tough approach to parenting, and that it was the source of arguments between him and his wife. This section of the document describes the breakdown of the Lennons' marriage, as witnessed by Mrs Jarlett. Their troubles came to a head in 1968 when Lennon drunkenly confessed to having affairs. She wrote: 'When Mr Lennon was at home there were often rows during meals when John seemed to be too severe with Julian and criticised the way he behaved at table. 'Julian, who was a very sensitive child at the time would become upset and Mrs Lennon would argue with Mr Lennon about this. 'As a result there would be an argument about the way Julian was being brought up. 'Mr Lennon would say Mrs Lennon was too soft with him. I think that he was probably not enough with his son at my house owing to his profession to know how to handle him. Mrs Jarlett crossed out a line from the paragraph stating: 'As a result he would often smack him'. The Lennons' marriage troubles came to a head in February 1968 when Lennon drunkenly confessed to sleeping with other women during their marriage. He suggested Cynthia take a holiday in Greece, and when she returned she found her husband and Yoko Ono sitting on the floor opposite each other wearing only bath robes. The nail in the coffin came in August 1968 with the news that Yoko was pregnant. 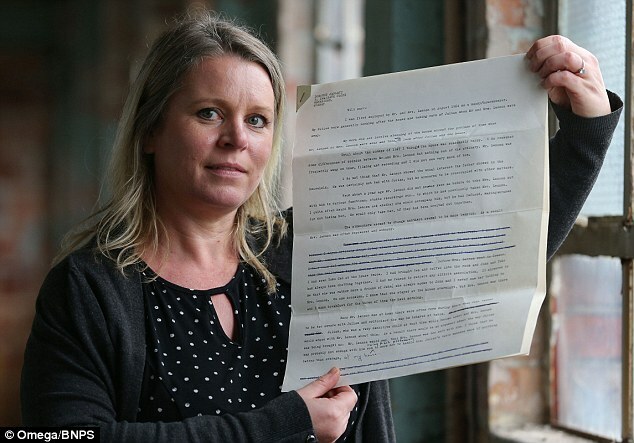 Karen Fairweather, manager of Omega Auctions, said: 'This sensational document has never been seen before - it was found among the possessions of Dot Jarlett, the Lennons' long-serving housekeeper, following her death last year. 'These papers were part of her estate but up until her death no-one knew they were there. 'Dot's statement is a fly-on-the-wall inside view of the life of the Lennons. Dot helped raise Julian and was probably the closest person to John Lennon aside from Cynthia and Yoko. 'In fact she was so loved that John named their dog Bernard after Dot's husband. 'The other parties involved in the divorce - John, Cynthia and Yoko - are never going to reveal anything about it so this is the next best thing. 'Dot was asked to provide an independent statement to Cynthia's solicitors. Originally John sought divorce from Cynthia on the grounds that she had committed adultery but as we all know it was the other way round. 'Dot had been to the solicitors and given her statement, and the solicitor has then drafted a document and sent it back to her to check. 'But she thought it best to cross out the stuff about John smacking Julian and his drug taking. Perhaps she thought it too controversial. 'Also, she was very close to John and would have felt some sympathy for him. 'We've had a lot of interest in this from collectors already and we are expecting plenty more, not just from the UK but internationally too. Link to article including more photos, videos etc. Note: According to the Omega Auction house website the sale is set not for this year but for May 2016. Now we know that Cynthia settled out of court, in my view for way too little seeing how she supported John during the lean early years and had Julian to take care of and all. But what if she hadn't? What would the fallout have been, do you think, if the divorce had gone to court? Would this kind of testimony have harmed John's standing in the eyes of his public? Or even impacted on his chances to get a US citizenship? What do you think? Maybe not. I doubt a divorce would have impeded John's efforts to obtain the green card. After all, each Beatle has been through a divorce. It was well documented that John didn't love Cynthia and never wanted to marry her in the first place. It is sad for Cynthia and Julian that the marriage was filled with strife and acrimony. Had it gone to court, Cynthia stood a good chance of securing a larger settlement. I don't know what the outcome would have been, but I think she stood a good chance of a larger settlement. I wasn't thinking about the divorce per se but about the drug and child abuse allegations, especially the drugs, whether they would've impeded him getting his green card or not. Cynthia may not have wanted to prolong the proceedings as she had their son Julian to consider. Think of the legal wrangling and the long drawn out process this most likely would have been. It would have taken an even greater emotional toll on young Julian. In her second book 'John', she touched on settling for far less than she should've because she just wanted the proceedings to be over with and I understand her reasoning. I remember reading about this some time ago. A piece of Beatles history but a very sad one based on Dot Jarlett's account of what she saw while working for the Lennon's. Using drugs and having children don't go that well together. The child is always the one to draw the short end of that stick. John and Cynthia's marriage was not a match made in heaven and no doubt Julian suffered tremendously as a result of the fallout. Fortunately Paul stepped up to the plate for him. It is interesting that Cynthia agreed to enjoy John's company in 1962. They did not sound like a well-matched couple from the start and sad to say, their marriage did not get off to an auspicious start. It was no surprise that the marriage did not last very long. This messy crap shouldn't be sold to the public. Too personal. I would agree. It's very inconsiderate to John's survivors. But everyone's out to make a buck. Even poor wronged Cynthia sold her John's handmade Christmas card and other private letters from him to her (why didn't she give them to Julian?) at auction. To Dot's credit, she didn't sell it. I guess her heirs see it differently.